Hi! I’m Brittany Wilmes, program coordinator at Pear Bureau Northwest. As half of the Communications and PR department at the Pear Bureau, I write about pear pop culture for The Pear Dish—sharing everything pear, from fresh recipes to community involvement to fun décor ideas. Have an article or idea to share? Feel free to email me! 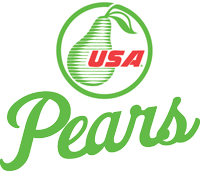 In addition to blogging, I’m busy sharing the pear love on behalf of the Pear Bureau Northwest…and eating USA Pears!